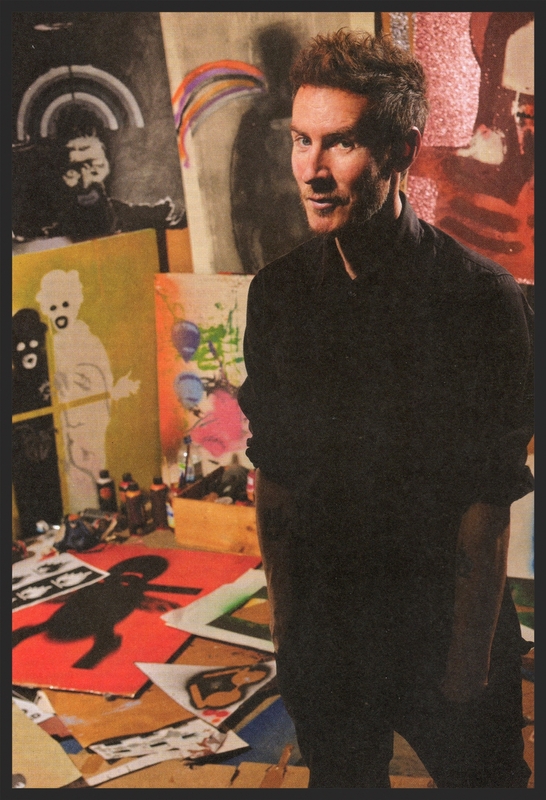 Anarchic roots and a healthy disregard for Western democracy surround Massive Attack’s Robert Del Naja, aka 3D. Better known for his contribution to the music scene, 3D’s artwork has featured on all of the band’s releases and he still holds his own in the current climate of the contemporary art world. One of the originators of the UK graffiti explosion, it wasn’t through the go-to channels of Wild Style and Subway Art that his experimentation with spray paint was sparked. Taking his cues from early punk album artwork, 3D was one of the first to experiment with stencils in the street. Once considered an outsider to the scene, his cutting-edge approach to graffiti paved the way for a new wave of stencil artists in the UK. 3D’s initial love affair with spray paint began with his interest in early MTV videos and punk music artwork. “I went out one summer evening in 1983 down on the Hotwells Road. There was a big derelict site down there that I’d had my eye on for a while. I had no idea what I was getting into though, in a way. I didn’t know how it was going to work in the conditions and if I was going to get caught. All I had seen up to that point had been snatches of graffiti art in the magazines and a little bit on video, you know, The Clash’s Radio Clash vid with Futura 2000, Malcolm McLaren’s Buffalo Gals and some of the early hip-hop videos. 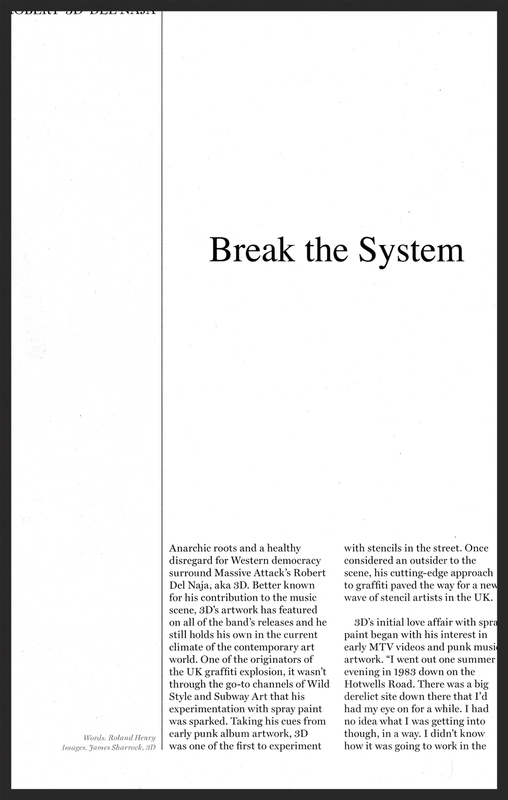 As the explosion of graffiti in the US crossed the water and caught the imagination of the UK’s youth, a young Del Naja picked up fanzines and other New York street publications. Hungry for more information on the scene, he sought more knowledge on some of the characters behind the movement, avidly following the swirling, interlinked art and music scenes of the time. With new inspiration flooding in every day, the biggest benchmarks of influence came from the US in the form of a couple of films that instantly acquired cult status, rocketing the rest of the art scene forward with a surge of inspiration. “Wild Style came out a year after we’d started. We went down to the arts centre on Stokes Croft to watch it and everyone was out. We went down to see it three or four times in a row, just trying to absorb everything, you know what I mean? Then, of course, Subway Art came out and that completely changed everything. You could sit there and study the work and it became a form of imitation as flattery. 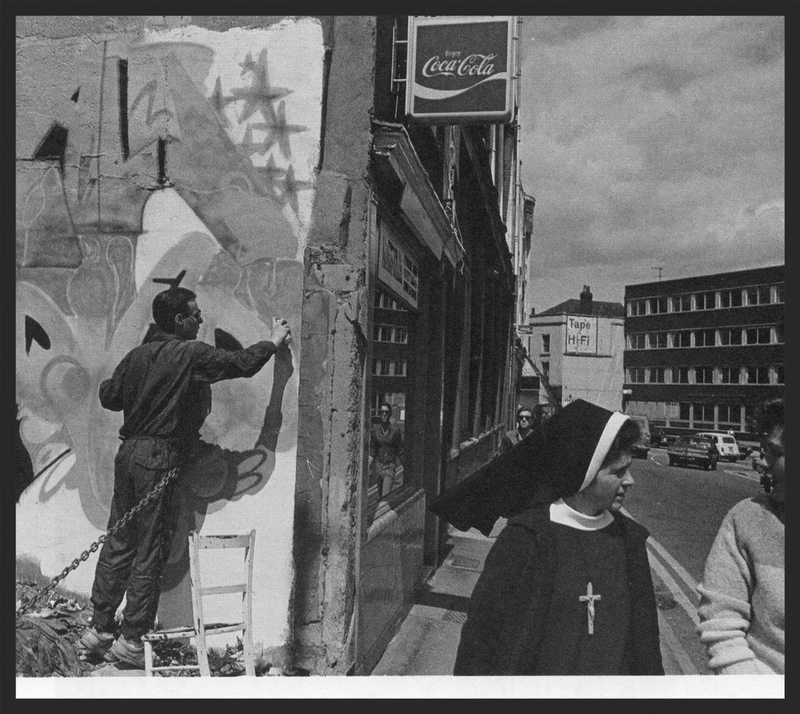 Meanwhile in Bristol and Birmingham, things were also taking off; 3D, Nick Walker, Pride and The Z-Boys joined forces with The Wild Bunch to put on a show at the Arnolfini in 1985, meeting with young artists Goldie and New Yorkers, Brim and Bio. 3D worked with Brim and the TATS Cru to produce the Bombin’ documentary, before moving on to help Goldie curate the ‘Rockin’ the City’ graffiti show in Birmingham in 1987. Leaving school halfway through the sixth form – “I was kicked out actually, I got suspended from school” – Del Naja developed his homegrown art form through a youth scheme magazine project, falling back on the British benefits system to tide him through the more threadbare moments. “We were trying to get into graphic design, I guess, and that didn’t really get me anywhere, so I spent quite a bit of time on the old ‘rock’n’roll’ Ca.k.a ‘dole’ or social security] – about six years. 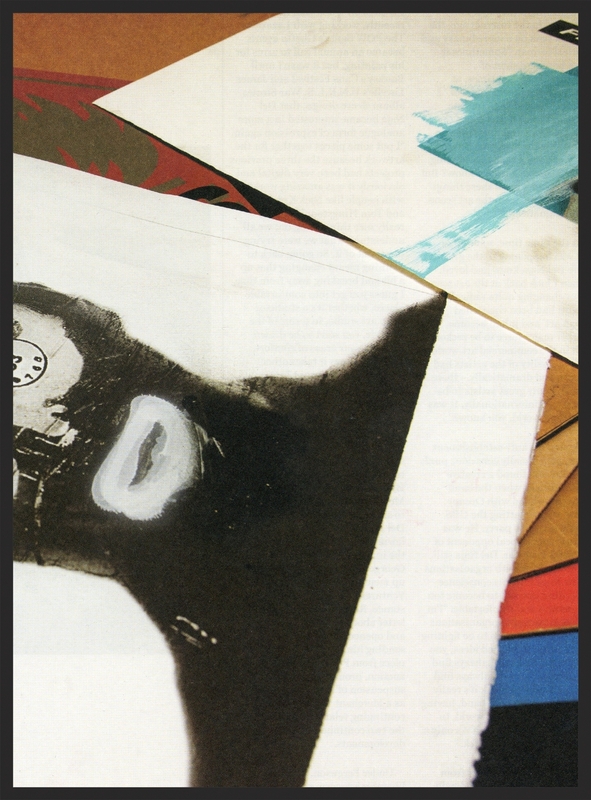 I think for me the punk sleeves and the paste-up ethos of making your own art was translated into making your own flyers, and when we did The Wild Bunch thing, it was almost an instinctive sense of what to do. “I spent a lot of years in the photocopy shop, first the black and white ones and then when the colour ones came out, I thought, ‘wow this is amazing’. I used to take photos of the paintings that I was doing at home and then I’d take them down and invert the colours on the copier. Before PhotoShop, that was my favourite tool, then I’d take them back home and start painting on the inversions. Because I’d been colourblind all my life, people always felt I had a strange way of seeing colours and I was always fascinated by the inversions -orange became blue, and that blew my mind. Finding some space in the garage of Dave McDonald, co-owner of the Dug Out, he was able to use it as a studio and gallery. 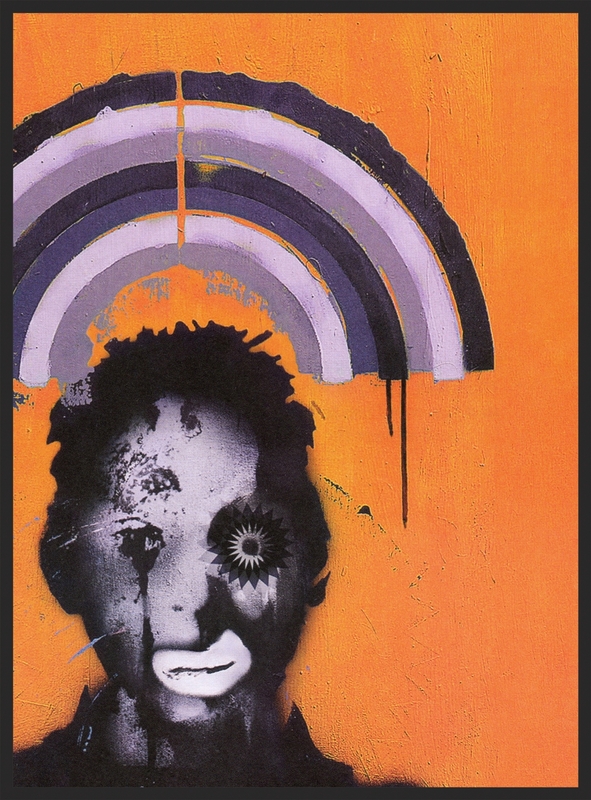 Ever the misfit, Del Naja wanted to pursue a different direction now the graffiti movement was in full swing. Influenced by Basquiat’s spontaneous style, he then began looking at Warhol’s repetitive images and studied stencilling and screen-printing. “No one was stencilling at the time, it just wasn’t on the radar at all. So I started doing these stencils of Marilyn, Maggie Thatcher, Robert De Niro, Mike Tyson. I did a Mona Lisa one, which was the one I put in the ’87 show in Birmingham that had mixed reception from the lads (laughs). They were, like, ‘what are you doing?’ It was almost like poison in the graffiti world at the time to be using a stencil; it was like a toxic piece (laughs again). Someone actually tried to rip off the canvas. There were rumours after that it was John Nation from the Barton Hill Youth Club, which I was quite flattered by, because I thought he was taking it home. But at the time, I thought that someone had ripped it off because they hated it so much and they were trying to destroy it. I was quite paranoid about this stencilling thing. While Massive Attack continued to grow commercially, 3D found the response he got from creating music more stimulating than the buzz of painting the streets. However, as the band grew, so did the opportunities for exploring new forms of artwork and the advent of the digital era brought with it more advanced computer-aided design programmes and fresh avenues for 3D to explore. The analogue ideas behind Blue Lines were discarded for a more hi-tech interface with which to engage the increasingly digital-savvy public. “With some of the images I was creating – some of the Eurochild characters and the monkey-type images – we started to create some computer versions, which began to appear on the Protection record and then defined the way we took our sound system show out. When it came to Protection, we wanted to create something more multimedia. So we started to try to recreate a sound system show but illustrate it. We tried to work with a virtual reality company and if you remember at the time in ’94, it was around then that the ‘Oculus Rift’ came out. Broadly taking a hiatus from his personal art, 3D sporadically his toes in and out of the art scene, releasing prints with Pictures on Walls and, more recently, working with Lazarides. The POW Santa’s Ghetto events became an annual call to arms for his painting, but it wasn’t until Banksy’s Cans Festival and James Lavelle’s U.N.K.L.E. 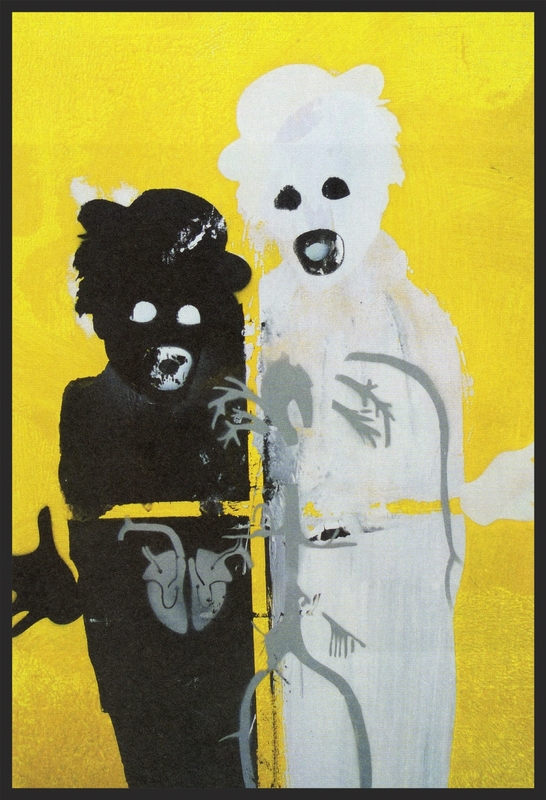 War Stories album sleeve design, that Del Naja became interested in a more analogue form of expression again. 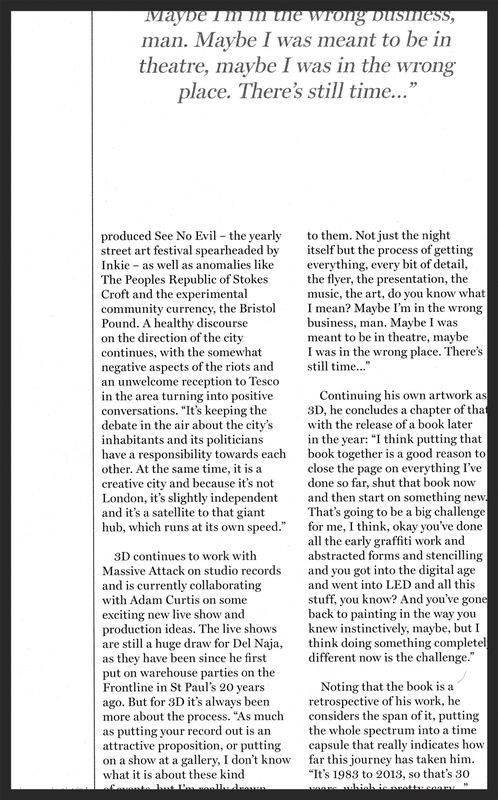 “I put some pieces together for the artwork because the three previous projects had been very digital and obviously it was amazing working with people like Nick Knight and Tom Hingston. We had a really nice thing going on; we all understood what we were trying to get out of it. So going back to painting meant changing that up a bit and breaking away from that. Heligoland was quite obviously based on references to the slave trade, and the colonial history of Bristol, opening the wounds of some debates that continued to rage on in the city over Colston Hall and the legacy of the Merchant Venturers. Never one to shy away from controversy, Del Naja stirred up a small hornets’ nest when he realised the independent Mayor of Bristol, George Ferguson, was a paid up member of the Merchant Venturers. Challenging Ferguson’s stance, Rob sent him an open letter about his membership and opened up a debate, sending him a slave-themed piece from POW for a charity auction, prompting the mayor’s suspension of his membership as a Merchant Venturer and a continuing relationship in which the two continue to discuss city developments.